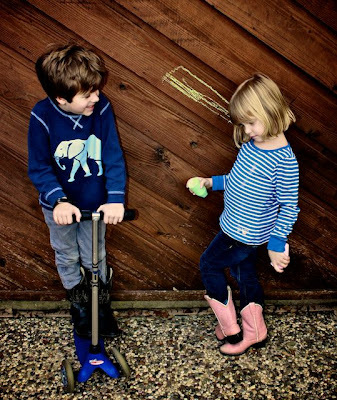 I'm a little befuddled that our two older children both own and love wearing cowboy boots. As a disclaimer, they were gifted to us. Nonetheless, they can't seem to take them off of their feet. They wear them with shorts, long pants, with sock and - ugh - without socks. It makes me wonder if this Midwest family is becoming inTEXicated. Jude laughs as his sister poses...again. Then this afternoon, I caught Dan on the computer looking at, you guessed it, cowboy boots. To which he added, "you know, I think I kind of like cowboy hats too." To top it all off, Jude was trying to fix something and Dan asked him if he was able to do it. "Well," Jude said, "ya need a mighty strong grip to do that." Your kids are the best! How do you NOT become in TEXicated?!?!? I love "inTEXicated"! I'm going to use that--will be sure to credit you. We've been saying "texified" or "swampified" (Houston is more marshy than Hill Country), but inTEXicated is way cooler.